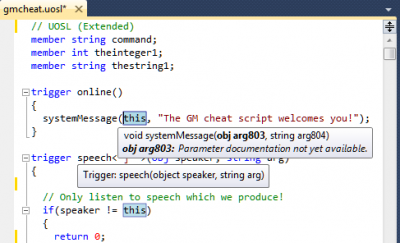 Active UOSL source parsing displays syntax and grammar errors as you work. Navigate to inherited files with a triple click on the inherits line. Visual highlighting of selected identifiers within scope. Text colorization for keywords and constants. Express editions cannot be supported currently. This extension does real-time parsing of UOSL source files. If you installed an earlier release of the UOSL Extensions using a Setup.exe program, uninstall this software via Add/Remove programs. Double click UOSLpkg.vsix to install this extension to Visual Studio. On an reported error parsing an inherits file, each reporting file may need to be closed and reopened, or edited to clear the error condition after the error in the offending file is corrected. The code context menu items "Go To Reference", "Go To Declaration" and "Go To Definition" do not do anything. In order for parameter help to pop up in an existing function invocation after typing (, put a space after the ( before you type it. This is not an issue for commas. Project Founder; UOSL Language specification; Divination; Demo SDK; and many other even more important things too numerous and mysterious to list. 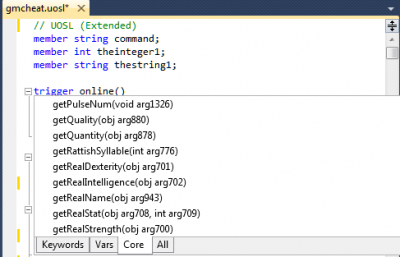 UOSL Parser and VS2010 language extension. This page was last modified on 21 July 2016, at 18:53.